Blue Bridge joins the members of NEFA for their National Equipment Finance Summit, taking place March 15-17, 2017, at the Renaissance Hotel in Long Beach, CA. Please come visit us in Booth #8. Since our inception, Blue Bridge has specialized in working with brokers to finance customers’ business upgrades and equipment purchases. 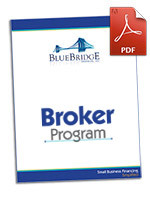 Blue Bridge is the partner that helps brokers customize seamless financing deals – and keep American business moving forward. The National Equipment Finance Association (NEFA) serves small- to mid-size independent equipment finance companies, lessors and brokers. With roots going back almost 30 years, NEFA offers educational programs and networking opportunities that help their members build relationships and succeed in the equipment finance industry.